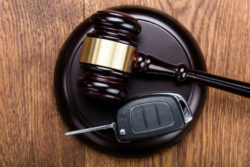 When a personal injury lawsuit is filed following a car accident both parties involved will have an opportunity to gather evidence that they can use at trial in order to help their side of the case. This process is known as “discovery” and one of the most important aspects of this process is the deposition that is given by the plaintiff as this details the facts behind the basis of their lawsuit. It cannot be stressed enough how crucial it is to not make a mistake when giving this deposition, as if you are the plaintiff and you give a false statement on the record and under oath about the incident you can lose the case before it even truly begins. That being said here are five important things to know when giving a deposition after being involved in a car accident. Provide as Few Details as Possible – Your best bet would be to try and avoid the deposition completely, but since that is highly unlikely your main goal should be to answer any questions you are asked using as few details as possible. The defendant’s attorney will try to ask you as many questions as possible especially when it comes to whose fault it is for the car accident and the full extent of your injuries, so while you should not refuse any questions that are asked of you that are within reason you should also not offer any more information than is required from you to answer their question. There will be a time and place to offer your version of the events but your deposition is not it. Be Aware the Defendant’s Attorney Wants to Set the Narrative – The best way to prove you are an unreliable narrator is by showing that you have several versions of your “story” and either do not recall the events that happened correctly or you are outright lying. Whatever answers you give in your deposition are expected to stay the same throughout the trial and if there are any changes to them they will be able to show that not everything you say is completely true. Be Prepared – It is because of these attempts to poke holes in your story that the best way to try and avoid this trap is to be prepared for your deposition hopefully with the help of a qualified car accident attorney. They will help you learn the information about your medical records, the police report, and any other pertinent details to your accident. A knowledgeable attorney will help you provide the documents requested by the defendant and they will make sure the information on those documents will be the same that you give during your deposition when that time comes. Despite all of the preparation however, be aware that you will most likely be asked questions you do not have the answer to and it is okay to say you do not know the answer especially because the last thing you would want to do in that situation is to just take a guess. The Answers You Give is Not All They are Paying Attention to – Being prepared and giving correct information is one thing, seeming nervous or awkward or irritable while you are being asked these questions is another. The defendant’s attorney is aware of how juries will react to people, so it is important to know that during your deposition the other attorney is not only paying attention to what your answers are to these questions but how you answer them as well. Expect the Unexpected – You will most likely expect to be asked questions involving your accident including the time of day, where you were going, what your injuries are, etc. What you may not expect is to be asked questions about prior injuries from years ago that the defendant’s attorney may be trying to tie in to this incident. It may seem unrelated but for all intensive purposes you will most likely still need to answer these questions honestly so it can only help to be aware that you may be asked things that you did not expect. When it comes to your car accident claim it is important to have a knowledgeable attorney like the ones at the Paris Law Firm who can best prepare you for the extensive process and stand up for you in court. Call us today or contact us via our online contact form to schedule an initial case evaluation.